A pegboard inside the door gives you added space for accessories. Umbrella stands are great to hold long bulky items like yoga mats. Use wire drawers in custom places. Use this trick to get rid of those clothes you don’t wear and free up some space. Hang bags on hooks for easy organization and storage. Use the same type of hanger for everything to keep your closet looking clean. If you find your current storage isn’t meeting your needs, buy more storage solutions! 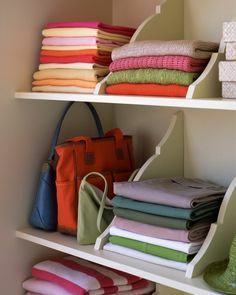 Shelf dividers, like these, are perfect to help with towel storage and organization.